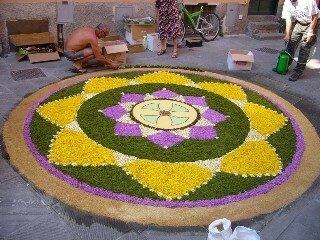 On Sunday, Jun 6th Monterosso hosts the Flower Festival - one of the most famous events of the Cinque Terre where the streets of the historic town get covered with flowers to honor a procession which takes place in the late afternoon. The floral display begins at noon, using flowers local to these lands including roses, bluebells and brooms, making the atmosphere even more fragrant. If you are visiting the Cinque Terre during this time, it is a must see event ! Return to Jun 2010 Events on LiguriaGuide.com.